Penn State Extension Philadelphia Master Gardeners : A Master Gardener Story in Volunteerism. As Master Gardeners, we often keep a critical eye out on the vast array of flora around us. Whether we look at plant species, form, growing space, etc....we assess and evaluate the beauty and the beast of plants and their spaces. This is a quick story about inspiration and change. It is also a reminder about civic pride, volunteerism, and how one person can make a difference, directly and indirectly. It's the essence of us, the Master Gardeners. The area in these photos is a heavily congested place of pedestrians, traffic, and Septa Bus routes. On the northwest corner of Bustleton and Grant Avenue in Philadelphia stands a wooded lot, now for sale. 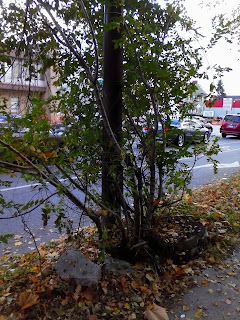 At some point, a massive tree had fallen into the street, which was cut down years ago, leaving the stump. After several years of sucker growth from this stump, a new urban jungle had emerged. 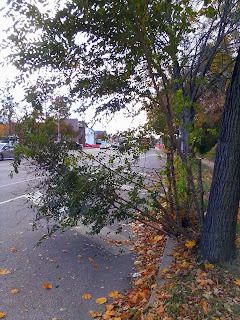 The limbs went vertically and horizontally, covering the sidewalk and jetting out into the turning lane of a major avenue. Pedestrians had to navigate a dangerous sidewalk, where the only safe passage was a small footpath in the dirt of the lot. 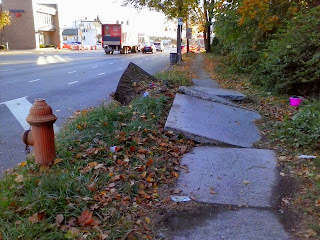 When the tree has fallen, it lifted the sidewalk with its roots, almost as if to say that some trees are not meant to be contained. For us, it is a harsh lesson on Right Plant, Right Place. 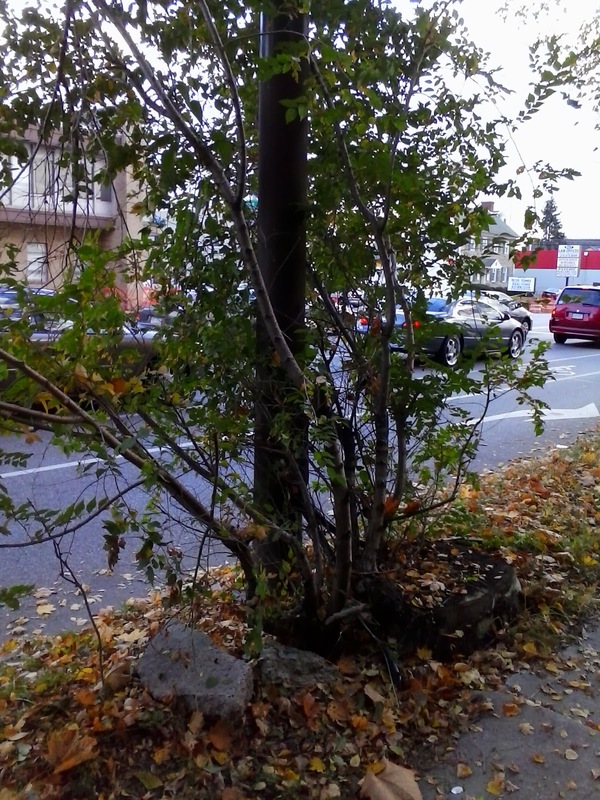 Perhaps people accepted the fate of the tree and resulting sidewalk/street situation as maybe someone else will take care of it, it's not my responsibility, the city is out of money and no one will do anything, etc...On a recent clear, crisp autumn day, I brought my Felco pruning saw and pruners to start making a difference in what public service for the betterment of our city means. After assessing the situation, I pruned the sucker growth from the tree stump, removed the suckers from other standing trees along the block, raked leaves, and picked up trash. What stands out are not the "after" photos but the people I have met in the short few hours that I was there. People waiting for Septa, elderly people with canes navigating the dirt path, teens walking by, seniors going shopping....these citizens were curious. What was this woman doing and why? As Master Gardeners, we educate people and not always in a structured classroom. The brief conversations touched upon tree structure, pruning techniques and why we prune, photosynthesis, etc....but it also brought out something else. People want to be engaged. They want to see purpose and a plan. Most were intrigued that one person can decide to do something for the good of other people and the plan often starts with themselves. The conversations made people aware that they are the community and they can do something about their space, whether through direct action, making a phone call, or inspiring someone else. One elderly gentleman, in particular, stated that he was proud of the little people behind the scenes who make good changes for others. As anonymously as I came into the picture as one of those "little people", I left with a renewed sense of community spirit and Penn State Extension pride in having learned about horticulture and how to approach and solve a problem in the green world. 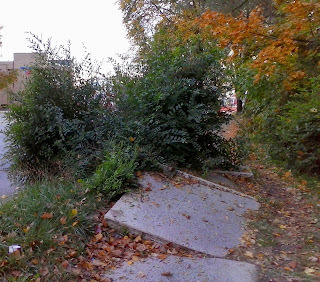 The sidewalk has been reported to the city and the local councilman's office has been informed of regeneration growth from tree stumps....lol.